While my wife Toi and daughter Holly went on a Girl Scout trip to England during the first week in July, I was planning on taking a longer-than-usual 5-day backpacking trip through the White Mountains with our dog Muffin, starting from Appalachia and ending in Franconia Notch, then taking the AMC shuttle back to the car. Of course, it didn't quite work out that way, and the first part of the trip consisted of a climb up King Ravine, two nights of camping, first at the Perch and then along Snyder Brook, and then returning to my car at Appalachia on July 3. At that point, I had only one more 4000-footer to climb, which was Mt Bondcliff, so after driving to nearby Gorham and picking up breakfast at McDonald's for Muffin and myself, I turned south toward Lincoln and the Wilderness Trail to begin my climb of Bondcliff. I pulled into the Lincoln Woods parking area just before lunchtime. It was extremely crowded, primarily with day trippers heading out to Franconia Falls, I suppose. To avoid some of these crowds, and for a change of pace, I decided to take the alternative East Branch Truck Road (which had been renamed to the Pemi East Side Trail). 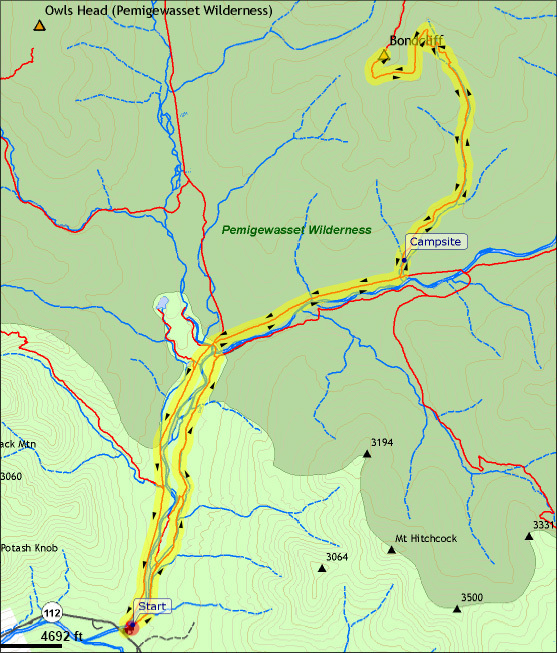 This trail parallels the Wilderness Trail, but on the opposite (east) bank of the East Branch of the Pemigewasset river. Muffin's feet were still a little sore from King Ravine, so we took it easy, enjoying the lazy summer weather and the occasional views of the river. Just over halfway to the new Franconia Brook Campsite, we discovered an old abandoned outhouse in the brush off the trail. I think this area may have been the site of an old logging camp, though most likely the outhouse had been part of a picnic area in the more recent past. 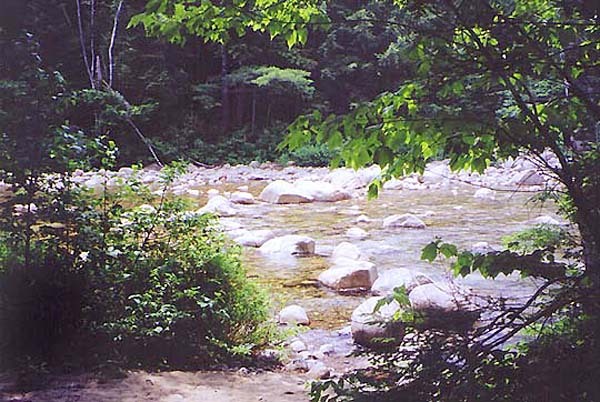 When we got to the Franconia Brook Campsite, I took a look around, trying to get an idea of whether I wanted to camp there sometime in the future. Although not particularly crowded that day, it appeared to be a popular summer spot. You can't drive to it, but some people had managed to lug in some large car camping tents and paraphernalia. After answering a camper's question about whether it was okay to wash her hair with biodegradable shampoo in the river (I told her that people drink that water and probably wouldn't appreciate soap in the water), Muffin and I crossed the river on large stepping stones to return to the Wilderness Trail. 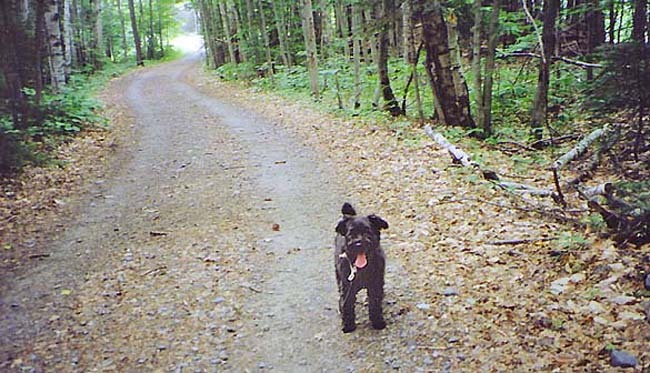 Muffin on the Pemi East Side Trail (East Branch Truck Road). This trail parallels the Wilderness Trail, but on the opposite (east) side of the river. 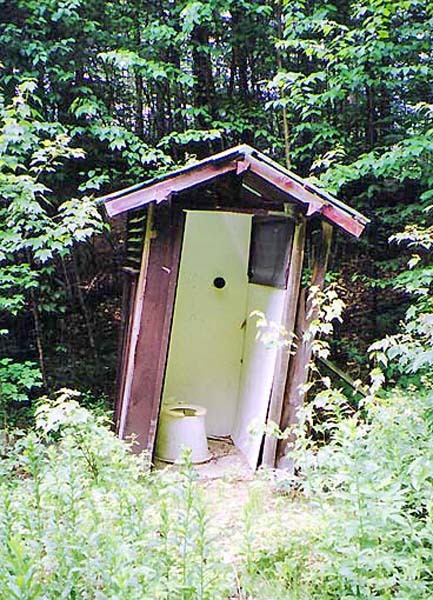 Old abandoned outhouse along the Pemi East Side Trail. I think this area may have been the site of an old logging camp, though most likely it had been used as a picnic area in the more recent past. 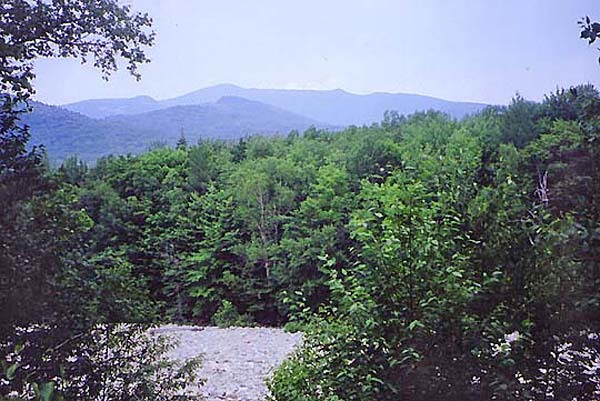 View across the East Branch of the Pemigewasset River. I'm not sure what the mountains in the distance are in this shot. 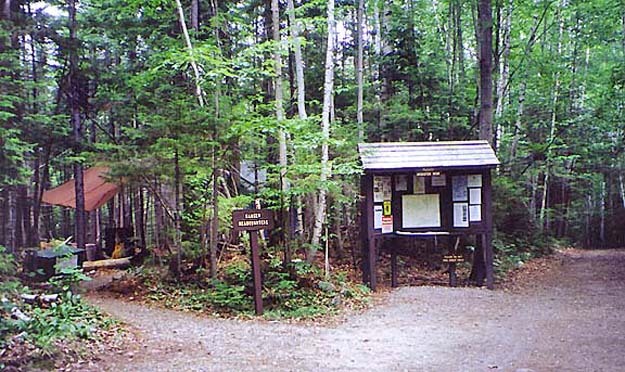 The new Franconia Brook Campsite. Located across the river from the old campsite, this appears to be a popular spot in the summer. The brook crossing. A connector trail crosses the river to the Wilderness Trail here on these large stepping stones.